Let’s get this out of the way immediately: Coriolanus is not Shakespeare’s best play. Not even close. With the exception of the titular hero, it lacks the memorable characters of Hamlet, Macbeth, or Romeo and Juliet. People who quote Shakespeare never quote Coriolanus. There’s never a moment in the play where you’ll think “oh, that’s from this?” and there’s no scene as visually iconic as the skull scene from Hamlet. In fact, there have only been a handful of film adaptations, and none of them have been particularly memorable. So you can imagine my surprise when I booked my tickets for Stratford this year and heard that you simply must see Coriolanus. Coriolanus is the story of a Roman general who hates his countrymen just as much as he’s willing to bleed for them. They do not love him as much as he thinks they ought to, and he can’t stand them in kind. Which hatred came first is a chicken and the egg sort of thing. As Coriolanus revels in his popularity, his city is under siege by a rebellious army led by Tullus Aufidius, a man Coriolanus has sworn to eliminate. But, when the public’s approval of Coriolanus shifts, and he finds himself banished from the home he loves, he teams up with Aufidius to burn the whole thing down. This play should be a brutal, awesome classic, a Shakespeare that young boys can revel in, and yet, the play is never as crazy as Titus Andronicus, whose ending (recently homaged in Game of Thrones) is simply bananas. This premise feels ripe for B-Movie exploitation with thrilling twists, dooming betrayals, and bloody revenge, but the play itself never fully takes off. By the end, it feels as though we have been cruising, and all I want is for something dangerous to happen. I don’t need a barrel roll, but a stomach-lurching drop in altitude would be nice. Something to get the oxygen bags out. And yet, by all accounts, this play is a triumph. Prior to seeing this show, I had heard nothing but terrific news. A room-sized poster greets you when you pick up your tickets at the Festival Theater. Big bold colors. Big bold font. CORIOLANUS. And underneath? Superlatives. ‘Outstanding!’ ‘Remarkable!’ ‘It brought my mother back from the dead!’ That sort of thing. Is it all those things? No. Even The Godfather isn’t The Godfather. But, I can say that this is one of the most striking productions of any play I’ve ever seen at Stratford. The play begins with a massive bust of Coriolanus that comes to life and hauntingly speaks to the crowd. The effect is like something out of Disney’s The Haunted Mansion, and from that moment on, the production design simply demands that you pay attention. As I’ve mentioned before, there isn’t a classic film adaptation of Coriolanus. Ralph Fiennes and John Logan did one a few years back, but it’s pretty dull, peaks too early, and it’s clear that Fiennes is drowning under the responsibilities of starring and directing. All this is to say, that the great Coriolanus film has yet to be achieved… until now. This is a play, obviously, but I have never seen a play that so desperately wants to be a movie. How badly does this want to be a movie? The darn thing has a TITLE SEQUENCE. From there we move to a radio broadcast center with numerous televisions, five star restaurants, steam bath houses, and marble-tiled courtrooms. The set design in this production is phenomenal, but I hesitate to call them sets. It’s basically one long series of rear screen projection, but the effect is so daunting, so all-encompassing with vibrancy and detail, that you feel as though you’re in an IMAX presentation. And that’s not where the cinematic angle ends. The production creates elevated sets, the rigging hidden by screens, creating a cinemascope frame, and then pushes the sets from one side to the other, creating the first pan shot I’ve ever seen on stage. At one point, Coriolanus steps out the rain, into his sports car, and drives for hours at high speeds, through forests, into the slums, all without moving an inch. There’s a scene where whole conversations are performed in text format with emojis. The play even implements closing screens on all sides to create an iris-out effect. It’s all very clever. You could find yourself saying, “this is how they should do a movie version!” But why bother? It’s already here. Which brings me to my biggest complaint. I was dazzled by the production design, but I can’t say the same for the performances. The set design is so exceptional that none of the performances are even remotely capable of competing with it. Michael Blake is a fine Coriolanus. He struts around the stage with purpose and his eyeballs are constantly in danger of bugging out of his head. He never transcends but it’s hard to with a role that isn’t built for that. Graham Abbey plays Tullus with a similar intensity. At one point, it seems like the play is going to address that these two rivals are in love because they have more in common with one another than anyone else in the world, but then it decides not to. In the plays showiest performance, Lucy Peacock (a name more apt than you can imagine) simply explodes as Volumnia, Coriolanus’ mommy. She’s the only one in the production who seems to know about the vibrant, ever-changing sets behind them and attempts to regain your attention by banging her fists and wailing in a way that only a Shakespearean mother can. She’s great. And finally, I have spoken at length about Tom McCamus in previous articles, and once again he stands out as Menenius, a friend to Coriolanus. There’s something about his voice that I can’t place, but he brings a level of importance and gravitas to every role. He feels comfortable in his skin in a way most actors can only dream of, and yet he is as commanding as DeNiro with the ease of James Dean. Director Robert Lepage is a legendary, but somewhat controversial, figure in theater. Stratford usually goes for the stripped-down approach to their plays. I’ve seen entire productions with no more set dressing than a crate. But they’ve really let Lepage go all out in this production, and the results speak for themselves. If you argued that this was an example of style over substance, I wouldn’t disagree with you. Nobody should walk out of a Shakespeare play talking about the scenery, but this play dares you not to. And I’ll take a play that demands your attention over one that asks for it any day. 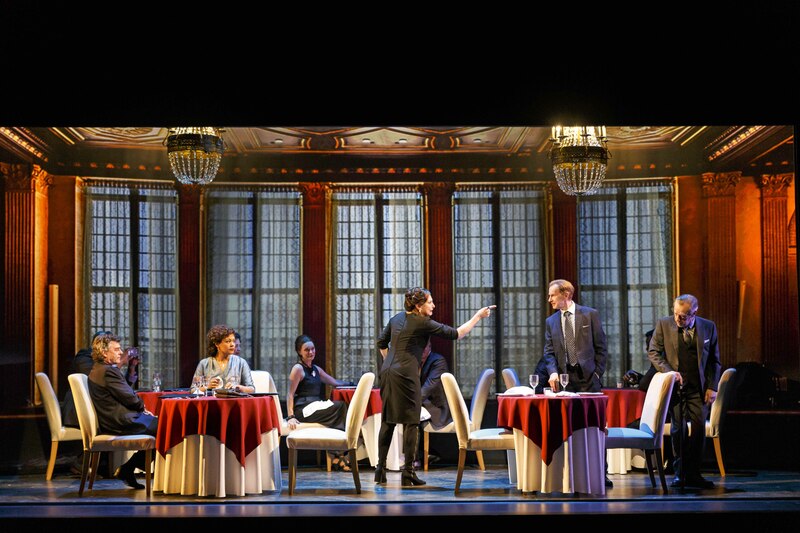 For more of Lukas Ridge’s coverage of the Stratford Festival’s Shakespearean takes, click here.